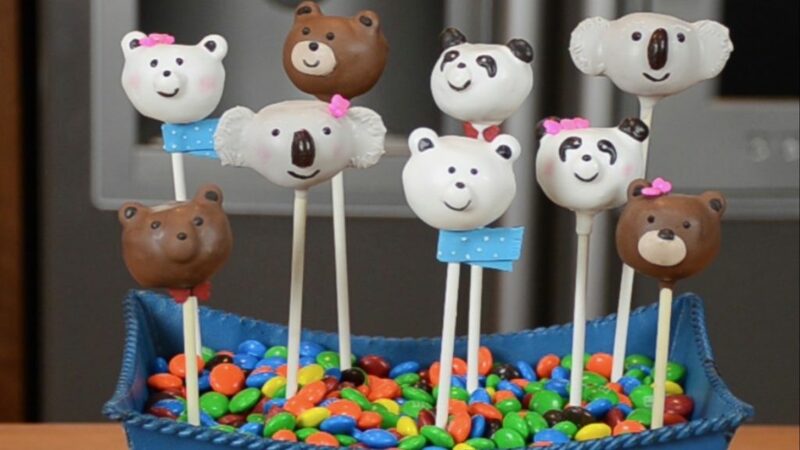 Learn how to make these adorable bear Oreo pops inspired by the game, Barenpark. Super yummy OREO pops! We made one batch with Birthday Cake Oreos, and another with Original Oreos. Mix crushed Oreos and cream cheese until well blended. Use your hands, if needed! Scoop the dough out of the bowl using a mini ice cream scoop so that they will all be the same size. Roll them into perfect ball shapes using the palms of your hands. Melt the candy melts on low power in the microwave stirring every 30 seconds. Watch it carefully because it's very easy to overcook. Dip the end of the pop sticks into the candy melts and insert the stick into the oreo balls. Chill them for 30 minutes to an hour. Prepare more chocolate and any decorations you want to add to the pops. Carefully dip the Oreo pops into the candy melts until covered. Lightly tap against the side of the bowl to remove the excess chocolate.